This aromatic Asian chicken gets its color and flavor from dark sesame oil. Position oven broiler rack about 5 inches from heating element; preheat broiler. Lightly coat a baking sheet or broiler pan with cooking spray. Put sesame seeds in small dry skillet over medium-high heat. Toss or stir for 3 to 5 minutes or until seeds are lightly browned. Transfer to plate to cool. Stir together sesame oil, soy sauce, and brown sugar in shallow dish. Place chicken breasts between 2 sheets of plastic wrap or in plastic bag. Using a rolling pin or other flat object, flatten chicken to 1/2-inch uniform thickness. Dip chicken in soy sauce mixture and coat evenly. Discard remaining soy sauce mixture. Place chicken in a single layer on prepared pan. Broil 4 to 5 minutes on each side or until lightly browned and thoroughly cooked. 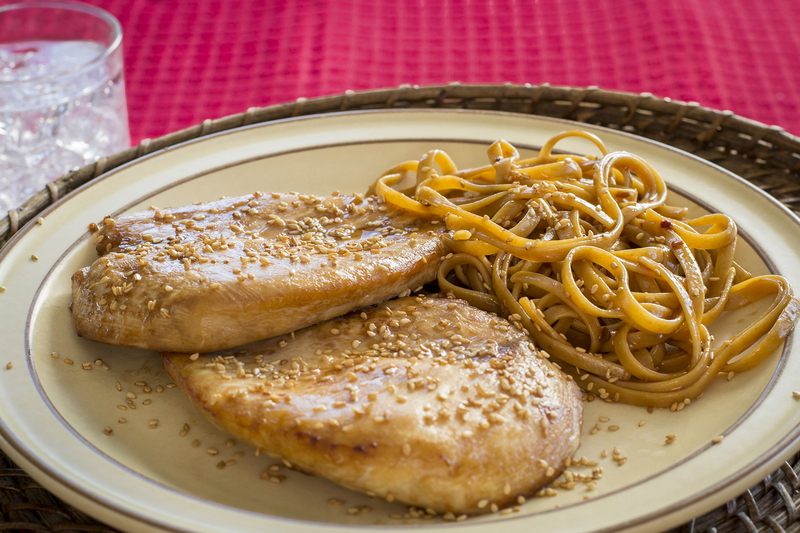 For each serving, place 2 chicken breast halves on plate and garnish with sesame seeds. Serve this aromatic chicken with Chinese wheat flour noodles with sesame-pepper dressing. If you prefer, cook the chicken on the grill for about 4 to 5 minutes per side or until lightly browned and thoroughly cooked.